Enticing cultures and unique flavor profiles have always fascinated Jamaal Taherzadeh. In his current role as executive chef at Libertine Social, a Chef Shawn McClain restaurant inside Mandalay Bay Resort and Casino, he combines his many years of cooking ethnic cuisines with bold flavors from his Persian heritage to conceive social and innovative menus. His drive to create memorable dishes stems from his passion to craft conceptually familiar dishes utilizing unconventional methods, providing guests with an extraordinary dining experience at the award-winning restaurant. Taherzadeh launched his culinary career in his hometown of Dallas in 2002 when he accepted a dishwasher position at Ciudad D.F., a traditional Mexican restaurant. Over the course of three years, his burgeoning skills and adaptability to work at each kitchen station took him from a dishwasher to sous chef, where he drove menu development and planned daily specials. In 2005, he embarked on a yearlong stint in the Las Vegas culinary scene, working as lead cook at acclaimed Japanese-fusion restaurant, Nobu at Caesar’s Palace. In April, he took a position as sous chef at Simon Restaurant and Bar inside Hard Rock Hotel and Casino and a few months later moved to San Francisco to be chef de cuisine at Impala Restaurant and Lounge. It was here that he developed various restaurant menus by blending his strong Mexican cuisine knowledge with South American ingredients and techniques. 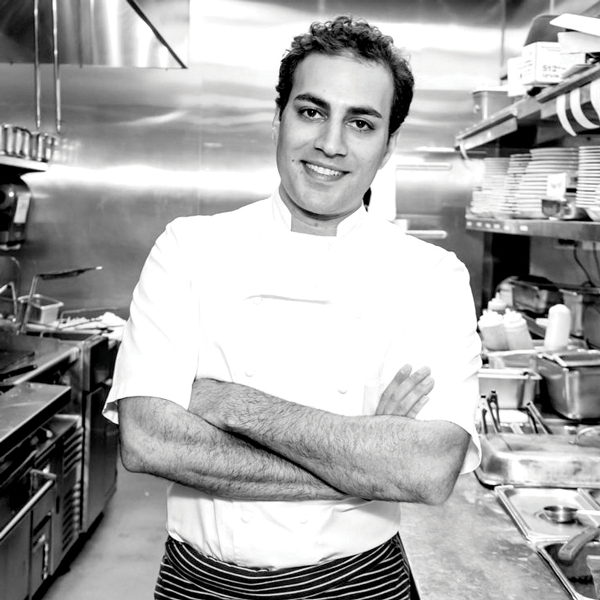 In March of 2006, One Industry Group opened Jones Steakhouse, also in San Francisco, and chose Taherzadeh as the opening executive chef. In 2007, Taherzadeh moved back to Las Vegas and started a new career with Simon Hospitality Group, working with former Las Vegas-based celebrity chef Kerry Simon. His first role was executive chef at CatHouse restaurant at Luxor Hotel and Casino and from there, he went on to hold executive chef positions at Simon Restaurant and Lounge at Palms Place, Kerry Simon Las Vegas and Sapphire Pool and Dayclub. In 2010, Taherzadeh moved to Malibu, CA where he became executive chef for nightlife and bar entrepreneur Rande Gerber’s Gerber Group, which operates modern bars and restaurants in hotels and resorts throughout the country. His main role was to oversee all culinary operations for the group’s restaurants and construct menus focusing on sustainable meat and seafood. He returned to Las Vegas in 2014 to oversee all culinary operations at Border Grill at Mandalay Bay and to hire and train staff for the opening of its second location at the Forum Shops at Caesar’s Palace. His exposure to Latin-influenced cuisine complemented the venue’s urban cantina atmosphere. In 2016, Taherzadeh had the opportunity to join James Beard Award-winning Chef Shawn McClain at his New American gastropub, Libertine Social at Mandalay Bay. McClain strives to sustainably source his ingredients and knew Taherzadeh would bring the same passion to his new venture, leading the restaurant’s culinary team as executive chef. Libertine Social offers innovative dishes which showcase Taherzadeh’s vast knowledge of worldly cuisines, cooking techniques, and sustainable sourcing such as the Roasted Petaluma Chicken, cooked sous-vide then roasted and served with a velvety truffled potato and Smoked Shrimp Cocktail, his take on the iconic appetizer infused with smoke from the restaurant’s signature wood-burning grill. As executive chef, he aims to establish an approachable atmosphere, yet surprise guests with exceptional plates using the highest-quality ingredients through modern preparation methods. His ingenuity in the kitchen and expansive culinary skill set gives him the ability to successfully lead Libertine Social and deliver the ultimate social dining experience.